With ScanSafe® travel folders, Bong is providing a favourably-priced, totally safe and furthermore easily customisable alternative to conventional models. They offer room for all possible documents such as boarding cards, passports, chip cards and cheques and even one’s car keys. The folders can be easily opened and closed thanks to a Velcro fastener. However, the special feature of the model and the reason why it was distinguished with a Promotional Gift Award 2018 in the category Communicative Products is the material: The folders are covered with Tyvek®, a unique fabric by DuPont™. In this way, they protect ID cards, mobile telephones, credit and insurance cards that are equipped with RFID chips from being damaged or personal data being read by unauthorised people; according to Bong the three-layered material blocks radio frequency waves to 99.9%. Furthermore, the outer layer made of silky, shimmering Tyvek® with its exceptional haptic feel proves at the same time to be tear-proof, anti-static, as well as dirt, dust and water-repellent. The folders can be full-surface imprinted in 4 colours with logos and advertising messages, special colours and effects are also possible. 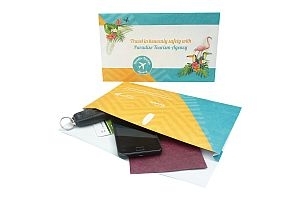 With such eye-catching personalisation options, the lowpriced folders make ideal promotional products for airlines, tour operators, hotel chains and co.